As an equestrian, cleaning your prized saddle is important because it helps prolong its life and protect your investment. 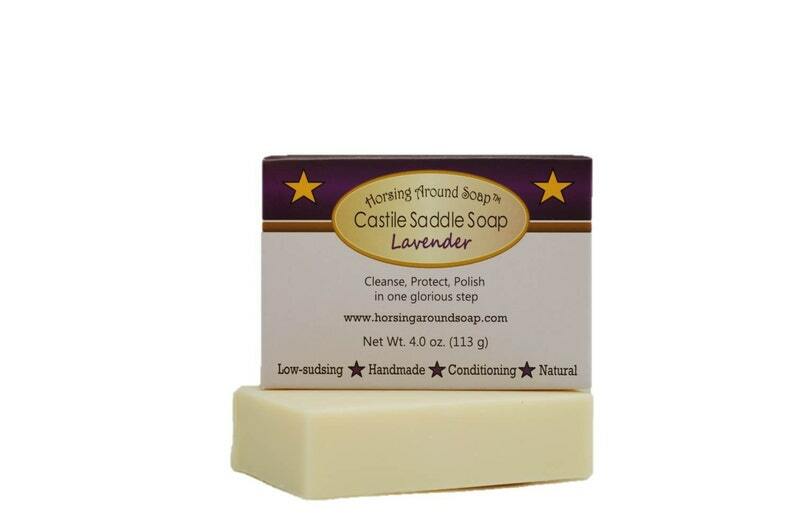 Our Castile saddle soap cleans and polishes without a lot of fuss. It is hand made from a moisturizing olive oil soap batter which gently cleanses your saddle without drying it out. With no harmful chemicals, phthalates, preservatives or colorants, this long-lasting bar is not only kind to your leather but also to your own skin. It is low-sudsing, which means you won't need a lot of water to rinse it off and that's a good thing for your saddle. Just dampen a sponge with a little dollop of soap and rub it onto leather. Then buff with a soft cloth to bring out the sheen. You’ll be amazed at the results! Lavender has relaxing, soothing properties with a peaceful, transcending fragrance. -	Made with food-grade high-quality olive oil. -	Gentle on your hands. -	Handmade in small batches. Each bar is cut from the main soap loaf and is about 1" thick by 3" wide by 2.5" tall and is ~ 4 oz. of soap net weight. Trial sizes are also available, approximately .6 - .8 oz. Handmade soap should be placed on a soap dish that allows air to circulate around the soap bar and the water to drain away.